The Smithsonian National Air And Space Museum | Top Places to See in Washington, D.C. 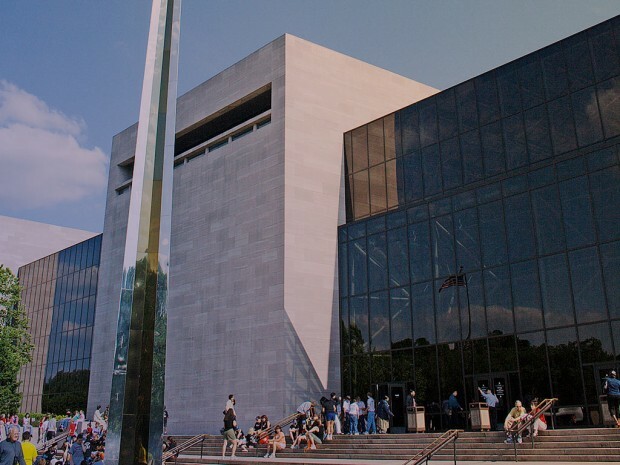 If you find aeronautics and space exploration even the slightest bit interesting, the Smithsonian National Air And Space Museum is an experience you won’t want to miss! The Museum was established in 1946, and opened it’s main building in Washington DC in1976, during America’s bicentennial celebration. The museum’s primary building, in DC’s National Mall, displays roughly 60 aircraft, 50 larger items from humanity’s travel and exploration in space, and over 2000 smaller items. The museum houses such famous artifacts as the 1903 Wright Flyer, Charles Lindbergh’s Spirit Of Saint Lewis, and even SpaceShipOne! The museum has about 9 million annual visitors, so you may have to wait in line for a while to get in. But it is well worth the wait! If you enjoy the museum at the National Park, you will probably also want to visit the Museum’s additional location. The Steven F. Udvar-Hazy Center, is located next to the Washington Dulles International Airport, 30 miles from the main Air And Space Museum. This annex may be less well-known and less visited, but it has just as spectacular of a collection! The Udvar-Hazy Center has about 170 aircraft, and 150 space artifacts on display, including the Space Shuttle Discovery. The Center also has an observation tower, where you can get a fine view of the air traffic at the Dulles Airport. Both Air & Space museums have free admission, and are open 10:00 am – 5:30 pm every day of the year, save for the 25th of December. For address, directions and other resources, click here. The Smithsonian also has many special events going on at the Air and Space Museum. Be sure and check their calendar, to see if there’s anything you wish to experience when you visit.